UWS Standard Chest Boxes are weather tight. 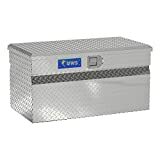 With the exclusive Foam-Filled Lid by UWS you can bet no other box is as dry and secure for your tools, sporting goods, luggage, and other stuff during the worst nature can dish out. With UWS you don’t worry because our boxes are fully welded, not just “Stitch-welded” like some. The Chest Series – for those who want storage without the look of a tool box.